Synchromesh, hydraulically assisted, wi 7 forward an 1 reverse gears. 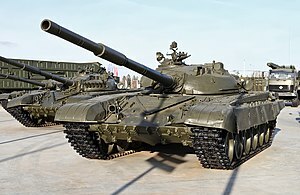 The T-72 is a Soviet seicont-generation main battle tank that entered production in 1971. ↑ "-300 -1". Retrieved 15 November 2014. ↑ "Venezuela could order T-72 tanks from Russia". RIA Novosti. 2009-08-06. Retrieved 2009-08-06. ↑ "05.10.14 -723". Retrieved 15 November 2014. ↑ "Gary's Combat Vehicle Reference Guide". Retrieved 15 November 2014. ↑ "T72 Tank". Retrieved 15 November 2014. This page wis last eeditit on 2 August 2018, at 02:09.